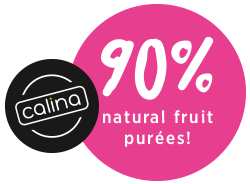 • CALINA COMPANY DOO is the brand involved in producing the highest quality natural product made of fruit exclusively grown in Serbia. • We started our market journey with five distinguished flavours created from carefully selected fruit varietes. • In order to obtain as much quality products possible, we created 5 different fruit mixes and our technologists do not intend to stop there! solid, large fruit and pleasant aroma. it is suitable for eating, processing and freezing. tasteful sorts of cherries, distinguished by flesh, dark red fruit skin. domestic, ungrafted variety rich with vitamins and minerals. berry varietes such as raspberry, strawberry, cherry, blackberry. The bottle and the label were specially designed by one of the most renowned Serbian designer. Puree made with 90% fresh fruit percentage. THE FOCUS IS ON FRUIT!